Kitting out your bathroom with something that looks great, functions brilliantly, and importantly, is affordable, has never been easier with the Essentials Single Ended Bath Bathroom Suite. Gorgeously smoothed sides and geometrically straight edges are blended with high-quality materials and sublime finishes to create a bathroom suite which performs and feels like a product with a much higher price tag. To ensure that our products are of the highest standards we use the best materials available especially when they’ll be fitted within a very moisture-rich environment. The toilet and basin are made from porcelain with a thick, luxurious layer of vitreous china applied to it. The vitreous china not only looks great with a high-gloss white finish but is really easy to clean due to its smooth surface. The bath and toilet seat are made of plastic which is also easy to clean and in the bath’s case lighter to install. When getting a new bathroom suite it’s important that the little details are just as good as the big picture and with Essentials you’re getting exactly that. The toilet seat benefits from a sleek, modern wrap around design and crisp white finish to match your pan and cistern. It’s been ergonomically designed to be extremely comfortable and comes with a brilliantly quiet soft close hinge system. Saving water is as important now as it ever has been so we ensure our products are efficient as possible. The cistern supplied with the Essentials toilet features a brilliant dual flush mechanism which allows you to choose between using the eco 3 litre flush or the larger 6 litre variation. This means you don’t have to use the full amount of water and can decide depending on the waste which needs disposing of. The cistern also benefits from inlets positioned on both the right and left hand sides for easier installation. No bathroom is complete without a gorgeous wash basin to rinse your hands or clean your teeth in. Luckily with Essentials we’ve got you covered with our stunningly contemporary, single tap hole basin. It uses a single tap hole which is positioned in the middle for convenience. This allows the fitting of any standard basin mixer so you can have optimal control over the water in your basin. The basin top is flat too so you’ve got that added space for a soap dispenser or glass tumbler. 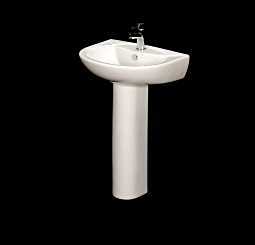 To ensure a solid and reliable installation the basin is supplied with a full or floor standing pedestal. They look great while adding that extra bit of support to the basin wall fixings. If that wasn’t enough they also double up as a great disguise for any pipework that runs from your tap and waste. Increase the usefulness of your bathroom with one of our fantastic single ended baths. They’re constructed to a high standard with a set of sturdy legs to ensure a strong and reliable installation that’ll last for years to come. You can easily purchase a separate bath screen to transform it from a standard bath to a shower bath and with a capacity of 185 litres you can soak away those rainy afternoons without the worry of using too much water.